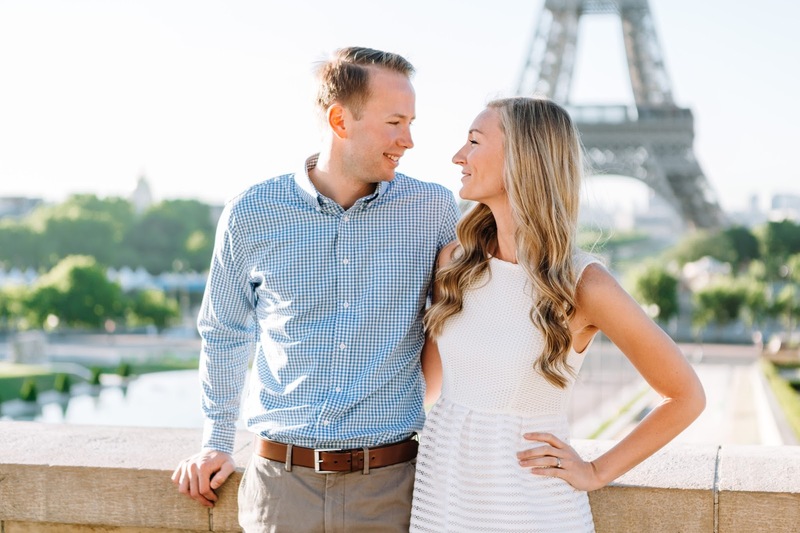 When John and I were in Europe, we decided to have professional photos taken as a way to help remember our trip... and we are both so happy we did! Here are five reasons to consider professional photos abroad. You want to enjoy your trip... and not experience your travels through the lens of your camera. Taking professional photos allows you to relax knowing that when all is said and done, you'll have some keepers to frame (so no need to try 30 times for a cute photo of you and your travel buddy when it just ain't happening... let it go - you have professional photos coming... my hubby appreciates this one!). 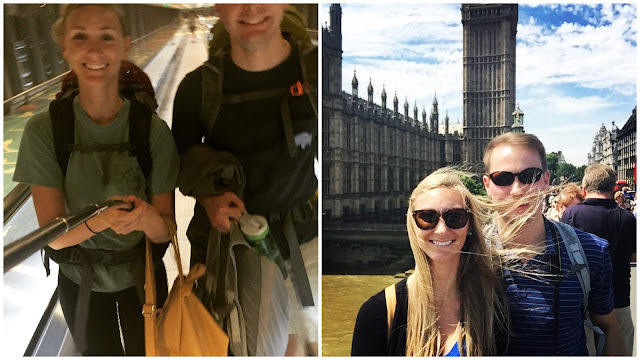 Don't get me wrong, I'm all about a offering to take another couple's photo (so that they then "think" to offer to return the favor), but let's be real, the chances that my new photo-swapping friend works a camera like a professional is not likely. Honestly, you'll be lucky if you can get a photo without a finger in the frame... and the whole "Oops, my hair is messed up; can you please try to take one more?!" can only be used twice max on the same person. Take this photo, for example... looking for my husband? He's behind that man walking in front of our picture. The truth is, planning a large trip is sort of like planning a wedding... there is a lot of time, research, preparation, and money that goes into the process... and when all is done and over with, you're left with one thing: the beautiful memories that you made during that time. And what better way to help you remember how beautiful your trip was than to get professional photos to help memorialize the trip? Shamefully, I tried out the whole selfie-stick thing. It works in a pinch, but it does make me feel a little bit ridiculous, and I'm certainly no selfie-stick genius (which makes the majority of the photos awkward and a wash). Traveling abroad is expensive, but taking photos abroad doesn't have to be with the right photographer. Also, it's just an hour (max) of your time, and in return, you will have beautiful photos to cherish forever. If you are interested in taking professional photos abroad, here are 3 tips for getting what you're looking for! Take photos early in the morning. John and I started our photos around 7AM, and at that time, the only other people out are either doing the same thing or are still out from the night before... you don't need 1,000 of your closest friends in your photos - so go early. This is personal preference, but I wanted an iconic location for our photos. 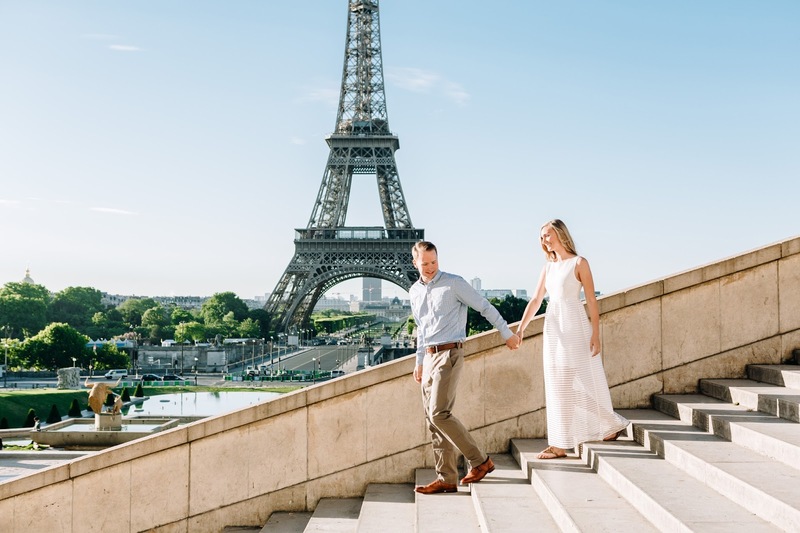 Around the city is great, but the Eiffel Tower (or any other major landmark) makes for great photos. Looking for a photographer? One thing that I've started doing is searching the hashtag #cityphotographer (for example, "#parisphotographer" or "#romephotographer"), then going through the results to find a style that you like. Looking for photos in Paris? You must check out I Heart Paris... Federico is so incredibly talented and I will forever cherish the photos that he took for John and me on our amazing European adventure! Side note: if you are consumed by wanderlust, you must check out their Instagram... it leaves me dreaming of Paris! You can read more about our time in Paris here! This is a great idea!! I would have never thought to do that. I'm sure you could easily find a photographer in any kind of budget too. The photos of you guys are beautiful!! Oh wow! Your pictures turned out amazing! I would have never thought about taking professional pictures while I was in Europe and now I'm kinda sad I didn't! Definitely something for next time. Wow, I die over those pictures!!! Those are memories you guys will cherish forever!! and your kids will one day be posting those on their instagram talking about how hott their parents were back in the day ;) I would have had NO idea how to even go about finding a photographer in Paris and knowing whether to trust if they were legit. Glad to hear your tips! We have a trip to Rome coming up in September, and I have thought about having this done...but I don't even know where to start! It seems like such an overwhelming process, and paying someone and getting your photo's when you end up on two different continents seems scary as well. I'd love to hear more about your experience with the logistics of it all! Those picture look amazing! I especially love the one with the Eiffel tower and the birds, so magical! I've never thought of this idea but it definitely makes sense for all the reasons you listed- especially for a big trip. We never get pictures of the two of us together because neither of us like to bother someone else and ask for a photo, so literally 99% of our pictures on trips are selfies that include like half of our faces, haha. Your pictures all turned out GORGEOUS! Girl- these photos are amazing!! And I never thought about hiring someone abroad, but it's a no brainer!! Asking strangers to keep taking photos gets old. I'll definitely be showing your post to my fiancé and we will keep is in mind for our Europe trip in 2017!! Lisa! I LOVE this post! I saw you had photos in Paris and I just about fell over, it was so gorgeous and romantic! You look absolutely beautiful too! Now I'm going to search for photogs in Northern Michigan for next month! (We are doing a tour of the great lakes, any recommendations??) :) Happy Thursday, girlie! Your photos are gorgeous!!!! I love that you guys did this too!! 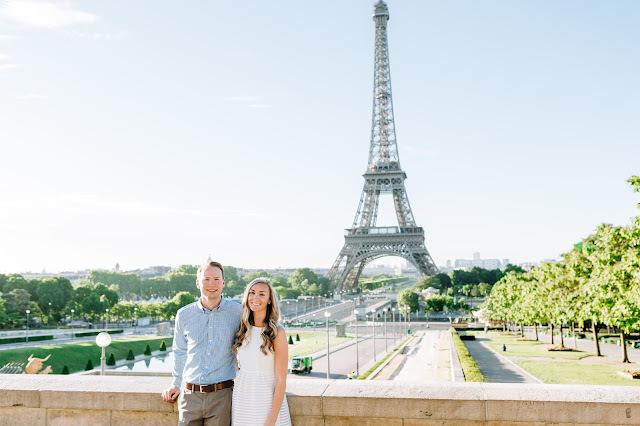 I'm absolutely obsessed with our Paris photos... and totally want to do them everywhere we go... lol!!! My husband is always dubious about me handing someone my camera.... so getting shots of us together is near impossible!!! I have never thought of this, but that is a brilliant idea. Those pics you had taken are gorgeous!!! This is such an awesome idea! I love that you did it. Y'all got some fabulous pictures out of it, too! Wow! I've never thought about this before! 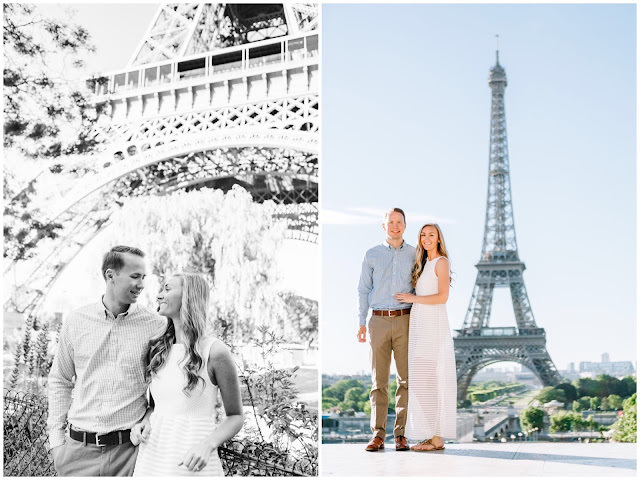 These photos are so beautiful and I love the idea of doing it super early. These. Are. Amazing. So gorgeous!! We bought a selfie stick in the spring and I've still felt too ridiculous to use it in person! Those photos are amazing!! What a treasure! I think professional photos anytime is a fabulous idea. Whether it's a trip or an event....I don't think many regret the decision when they get their beautiful photos! Thank you so much for posting this! Your pictures are exquisite and I had never thought of doing this! I'm SOOOOO glad you did it! They are GORGEOUS!!!!!! I've never thought of this but this is brilliant and they are AMAZING! I SOO wish we would have done that. Yes to the horrible photos you get when asking someone to take one of you. Your photos are downright gorgeous girl!! Those are incredible photos! Beyond gorgeous! 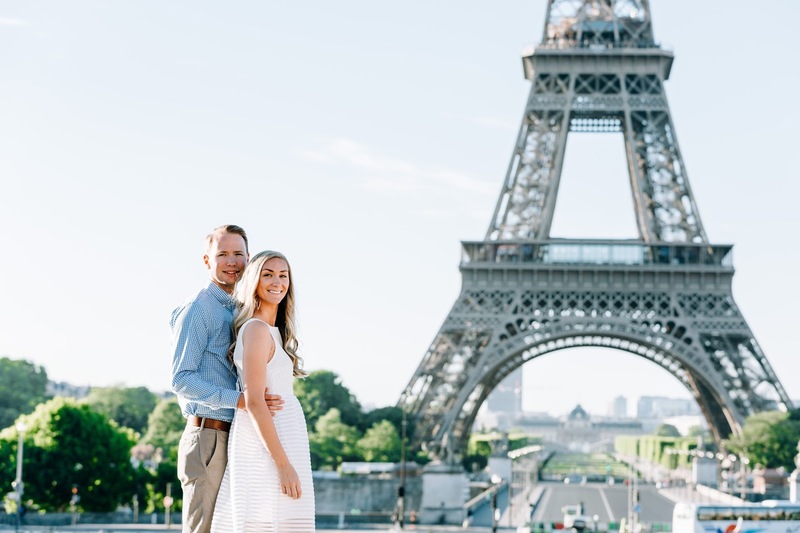 Y'all look soooo happy and like you definitely belong in front of that Eiffel tower! :) Having a professional photographer is such a great idea! Beautiful photos! We did the same thing a few years back with the entire family in Mexico. I still have one of just the hubby and I framed. btw -- I love the dress. Your professional pictures are STUNNING!!! 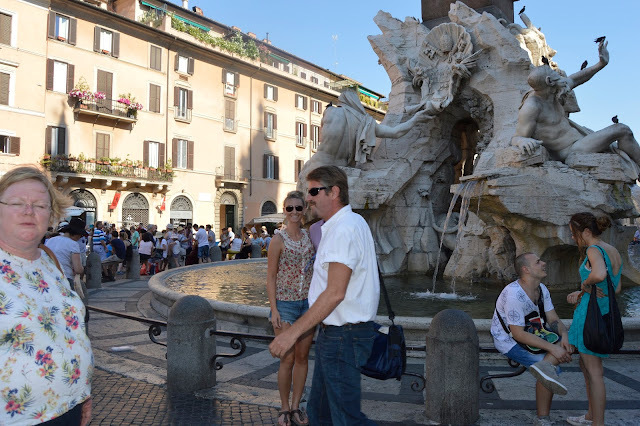 After seeing your pictures, I would definitely want to do that whenever we go to Europe! Your photos are so incredibly gorgeous! I never thought to get professional pictures taken while on vacation but it makes total sense. These are amazing! love those photos and so agree! Your professional photos are absolutely gorgeous! I think this is just the best idea and creates some of the best memories! Oh wow, love these ideas and tips !!! Something to keep in mind for sure. And your professional photos look so gorgeous ! those selfie candids are hilarious! i looked into doing this but in the end decided not to. i totally wish we had now! Wow, those photos are so stunning!! 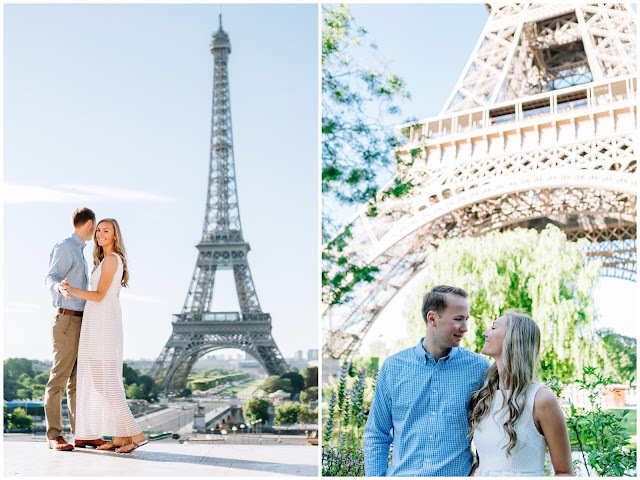 Matt and I got engaged in Paris, so it would be so special to go back one day and get some professional photos done! I'll have to save this post! !